This week’s sunset is from Ao Nang Beach, Krabi, Thailand! Thanks to our reader, Kay Maclean, for sharing this beauty with us…we miss Thailand! We have spent over 5 months in Thailand and we absolutely love it there. We love the food, the people, the scenery, the culture, the relaxed atmosphere and even the Thai music (especially the band Potato). We still consider Thailand like a second home to us (like many digital nomads) and we can’t wait to return one day. It is sunsets like the one above that really make us want to pack up our bags and head there today. We recently heard about a new service that we may use to get to Thailand, or any other destination once we leave Grenada. It’s called Tripscan and it’s unique because it allows you to book your trip using different modes of transport. Sometimes a flight isn’t the cheapest way! Tripscan will search flights, cars, trains, buses, planes and even ferries to get travellers to their next destination cheaply! This is a very interesting service and something that we’ll definitely be looking into further. We’ll let you know how it goes. Do you have a sunset you would like to share on Goats On The Road? Send us an email and we’ll be happy to feature you on our site! CLICK HERE FOR MORE SUNSETS! Ah, Thailand! 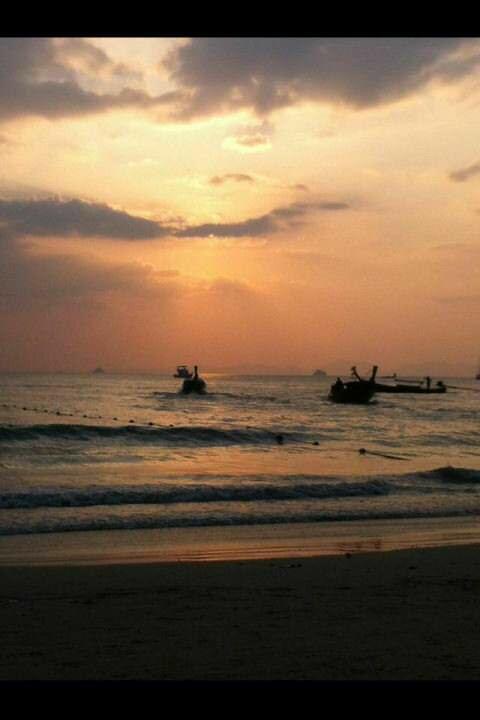 How I miss the beautiful sunsets – some of the best we saw were in Ao Nang and Koh Lanta. Can’t wait to go back! Love your sunset photos! This one really takes me away!